The signs have been promising over the last few matches and positivity seems to be creeping back in amongst the majority of players and staff, the clean sheets are returning and the basis is there for the season to be recovered. However, there are three major reasons that will continue to restrict our progression unless the Manager changes it. 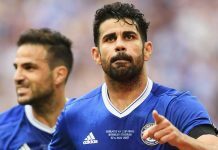 They are Chelsea’s current three weakest links and they go by the names of Branislav Ivanovic, Cesc Fabregas and Diego Costa. Apart from yesterday, Jose Mourinho has insisted on sticking with picking these three players and I am afraid that this has been the major link to our downfall. Other players have struggled to capture form but are once again showing the signs of class, but for me, these three players need to be replaced. Starting with Ivanovic, he has lost his reliability and is a danger at the back, he gives away rash free kicks, loses the ball and offers nothing going forward down the right. When he plays, we are missing out on a right sided outlet in attack – which in part then means we are not as good going forward as when Cesar Azpilicueta plays on that side. It also wastes the left sided full back position playing a right sided full back there. Ivanovic has had his day, he offers nothing any more and is a liability wasting what could be another good attacking outlet. I mean, he has started both Baba Rahman and Kenedy in the left back slot recently and both were excellent, why on earth do they not keep their position? It’s beyond belief. The provide the fresh youthful energy and determination needed out there. Cesca Fabregas has not even been half the player he was when he first arrived at Chelsea. He has failed to produce creatively, albeit a few bright sparks and passes in recent matches. But for me this isn’t really the issue, he can get that back. It’s his defensive capabilities that worry me. When you play as part of that two in centre midfield, you simply have to be combative and a good defender as well as a good attacker. Fabregas is a poor defender and is proving a real liability when we are under attack. He needs to be used more advanced and we need a player like Ramires, Ruben Loftus-Cheek or bringing in a Paul Pogba type players in that role. Players who can contribute in both attack and defence. Finally, you look at our attack. We are struggling to get goals. We have improved our defence but we are lacking a striker to finish off all the tippy tappy passing moves. Recently we have looked slick and mesmerising in attack making some excellent moves, but then you look at our main man up top Diego Costa, he is too busy dropping deep getting involved with the passing moves, moving out wide or trying to fight the centre back. He is basically doing everything apart from what he should be doing, getting in to poaching positions, playing off the last man and making the runs in behind. This is what we are badly lacking. Add to that his school boy attitude I really believe we need to cash in and move him on. He isn’t the type of striker that we need. We need someone with similar aggression and strength, but someone with intelligence, skill and the vision to make those runs in behind and get in to scoring positions. Costa for me just doesn’t have enough about his game. He is far too head down on the ball and clumsy. If we can sort these links out in January, then we’ll be top 4. If Mourinho insists on sticking with them, best we can hope for is top 7.